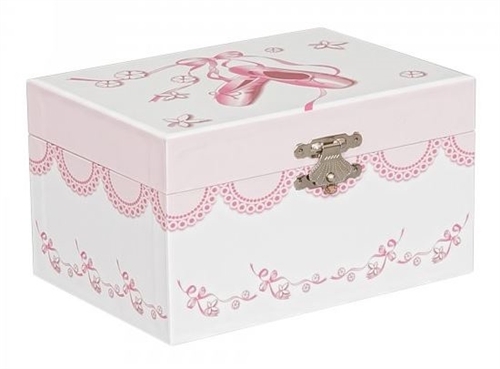 Feature: Music box plays "Waltz of the Flowers"
Decorated Girl's Musical Ballerina jewelry box with ballet slipper and ribbon fashion paper overlay. Lift lid holds an interior mirror. Spinning ballerina plays "Waltz of the Flowers". Single compartment offers open area storage. Hand lined in pink suede fabric, with silver tone latch and hardware. Measures 5 7/8" x 4 1/4" x 3 1/4". Small parts can be a choke hazard, only appropriate for children 8+. Ballerina Jewelry Music Box. 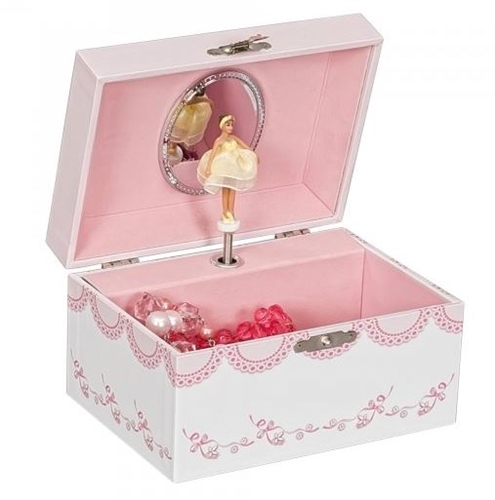 Girls White and Pink Music Box Wood Ballerina Jewelry Box with Ballerina Spinning to Waltz of the Flowers Plastic Ballerina Music Jewelry Box with Butterflies Mele Ballerina Jewelry Music Box. Girls Musical Jewelry Armoire.